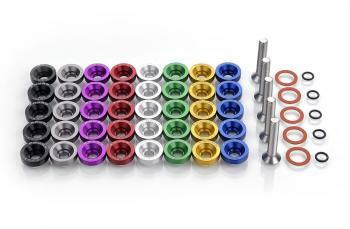 Add that last finishing touch to your engine bay with these all new Password:JDM Valve Cover Washers! Offered in anodized black, blue, gold, purple, red, gunmetal, silver, and the all new green these valve cover washers feature the Password:JDM Kenji logo. All Password:JDM fender washers are constructed from aircraft grade aluminum and are matched up with long lasting stainless steel bolts. The Password:JDM Valve Cover Washer Kits include five Valve Cover Washers, five fiber gaskets, five o-ring gaskets, and five stainless steel bolts. (B-Series VTEC kit includes 4 washers). Great price and good company to buy from! Ordered Borla headers 17216 that was lowest price on internet. Shipped fast at a fair price and arrived in good condition. Communication from Autoplicity was timley and accurate with tracking number. I would not hesitate to order from them again. By far the best price, easy ordering, and fast service, what else is there? Good pricing, quick shipment and delivery, great seller! Great place to shop online. The best price on the internet and super fast delivery. Shop with Autoplicity, highly recommended. The lowest price on the web.